Since fatigue is a rather broad term that can encompass many imbalances (as you will have seen from my previous blog entry), I wanted to elucidate some more case scenarios where this is the main presenting symptom. Fatigue is probably one of the main conditions dealt with by health practitioners and health stores. Firstly, most people who are tired don’t drink enough water. You can work out how much water your body needs using the following equation: your body weight in kilos x 0.033 = how many litres of water you should have daily. For example: if you weigh 51kg x 0.033 = 1.7, your intake would need to be around 1.7 litres a day. Some people don’t absorb their fluids. If you find you are going to the toilet within a short space of time of having a glass of water, consider adding a pinch of sea salt or a small amount of unsweetened pear or peach juice to this. If this is isn’t the case but you need to increase your fluid intake, try some herbal teas that are caffeine free that will contribute to your total fluid balance. Queanbeyan Health Foods stocks a beautiful range called Pukka that focusses on restoring vitality. Try 3 Mint (organic peppermint, spearmint and field mint) if you suffer from frequent bloating and constipation or Revitalise containing cinnamon, cardamom and ginger to warm and invigorate you. Alternatively you can add 2 tsp of liquid chlorophyll to 600-1 litre of water. This is green water and is fabulous for keeping you alkaline, due to the high magnesium content. It’ll also help to keep you ‘regular’ and is a natural body deodorant and skin cleanser. Alkalinity and frequent bowel movements are essential to high energy levels and are always affected by a lack of hydration. Other ways to make drinking water more enjoyable are to invest in a water filter jug or a good quality ceramic filter and drinking natural mineral water (try Silicea). However, it’s important to drink your fluids between meals to lubricate the digestive tract. It’s also a good idea to avoid drinking fluids when eating as these can dilute stomach acid and interfere with digestion. So, you can achieve a lot of health benefits and improve your vitality just by increasing your water intake using these strategies. Another reason for fatigue that is quite common in women of child bearing years is low iron, particularly stored ferritin due to monthly blood loss. If you find you’re getting run down fairly frequently and more susceptible to colds and flus, feel the cold and get puffed easily it wouldn’t be a bad idea to have your levels checked. Also, if you’re a vegetarian and menstruating your recommended daily intake will be higher – around 26mg which is what is recommended by the NHMRC for pregnant women. Vegetarian men also a need a higher intake, around 16mg which is double their normal daily intake. 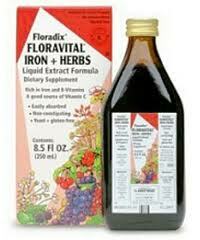 Queanbeyan Health Foods currently has free samples of the Floradix and Floravital liq uid iron. This is suitable for vegans and vegetarians and contains iron rich herbs such as hibiscus and nettle. It also contains pear juice which binds to the iron in the supplement (ferrous fumarate), creating a complex for easy absorption. The Floravital was created for people with a gluten and yeast intolerance and other chemical sensitivities. The dose is 7.5mg per 10mL which tends to reduce side effects such as constipation. Stay tuned for more instalments on what causes fatigue. In the meantime if you mention this article you can have 10% off the Pukka range or Grant’s Liquid Chlorophyll but only until the end of August which is when Sally’s super sale ends.